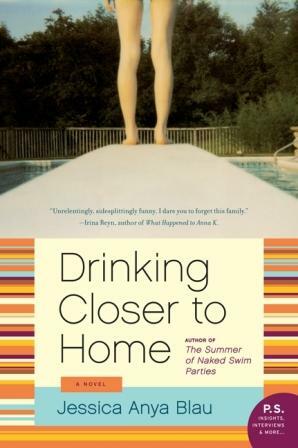 This month’s TNB Book Club selection is Jessica Anya Blau’s Drinking Closer to Home. 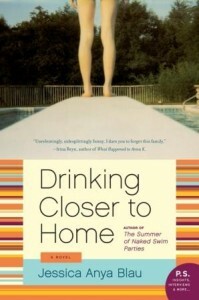 The Harper Collins website briefly describes the novel this way: “They say you can never really go home again. Adult siblings Anna, Portia, and Emery are about to discover just how true that is. Do you relate to the Steins? If yes, how so? What do you think of Louise? Do you find yourself oddly sympathetic toward her? And what of the three children, Anna, Portia, and Emery? Please take a moment to share your thoughts about these characters – and anything else that you’d care to discuss – on the comment board below. Share what you love (or are frustrated by), what’s making you think (or feel confused), or any other thoughts you might have about our March TNB Book Club Selection. Also, as a reminder, our cyber-chat with Jessica Blau is going to happen on Sunday, March 27th, at 8:30pm EST / 5:30pm PST. Be on the lookout for an email with instructions, which should be coming your inbox soon. Second. And I love YOUR book! Am reading it in French right now–FABULOUS translation! Congrats! It was hilarious Jessica! (And touching too.) I loved getting to “meet” the rest of your family in the post script. I must confess that I had a hard time keeping the daughters straight in my head, because I kept trying to figure out which one was more like you. When I related the story of your mom (re: the title) to my parents, my dad looked so shocked! Until I reminded him of the time his parents had left him at home while they went to a funeral. My grandmother would roar with laughter when she’d tell of seeing him out the church window, walking with such purpose and pulling his little wagon all the way. He was less than 3 years old. It’s amazing ANY of them survived to bear children of their own! Yes, exactly, amazing that generation survived! And, I suppose, a lot of them didn’t, right? Why do I see the Little House on the Prairie church when I see your dad walking by with that wagon? Where did this take place? Love the image! THANK YOU for reading the book! I’m Portia. Or Portia’s based on me. I’m me. Portia’s Portia. But they overlap a lot!